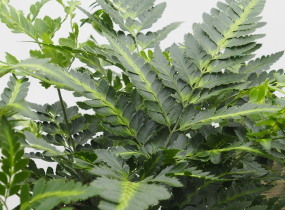 Unusual, evergreen, soft-textured fern which forms a low, tufted clump of finely divided green fronds which are covered on both sides with soft, rust-brown hairs. Prefers loose, gritty neutral to acid soil, and can be tucked into crannies in walls in partial or full sun. Protect from wet conditions.Height and spread 20-30cm. but more stock expected soon.